Should I be worried about fake whisky? You know how you can always depend on whisky? How you know where you are with a nice bottle from your favourite stillhouse? Well, I’ve got some bad news. It seems that, in the post-truth world of 2019, we can’t even depend on Scotch to keep it real. Word on the web is that the booze industry has been invaded by whisky counterfeiters out to make a quick dollar with knock-off hooch passed as the real deal. Everything’s fake these days, isn’t it? Fake news, fake facts, that fake flat I rented that turned out to be a shed inside a slightly larger flat (£850 pcm). Where, I ask you, will it end? It doesn’t take much digging to turn up stories of false booze in the news. The way I hear it, there’s suspect Macallans turning up everywhere from fancy Swiss hotels to the archives of the Speyside juggernaut itself. I even found one story about the feds of Scotland Yard busting an alleged counterfeiter accused of trying to pass off homemade ‘antique’ whiskies as the real deal in auctions. Not to mention firms online telling us to get our bottles chemically analysed or even carbon-dated to make sure they’re on the level. How can I be sure that my modest stash doesn’t contain cheap replicas – liquid versions of the two-stripe tracksuit I got bullied for wearing at school? What about the bottles for sale in the supermarkets? Can they be trusted? Is Scotland even a real place? But something’s telling me I should hold off before marching into my local spirit merchant crying conspiracy like some riled-up whisky truther. I reckon I’ll need to look past the headlines and do some honest-to-god research and opinion-forming on bogus Bourbon, sly Scotch, and… perhaps a third alliterative type of fake booze as well. The first thing I notice about the stories doing the rounds is that they’re mostly about recreations of rare and exotic liquors that represent maximal pay-off for rascally scammers. I don’t buy much in the way of museum-grade naughty water, so I guess this doesn’t affect me directly. This is a relief in a depressing sort of way, like realising you’re unlikely to be robbed because nobody wants your humble, shed-dwelling possessions… Whatever. My take-home is that, as long as I’m not buying my whisky from a car boot and I stick to familiar brands, then I should be relatively scam-proof. So yeah, most hooky hooch (alliteration number three, nailed it) that makes the headlines is high-end stuff that’s out of my weight class. It’s about as much a concern of mine as the fluctuating price of unicorn leather or inheritance tax. But, like every broke young fella with a pocketful of whisky dreams, I hope one day to be wealthy enough to attract the attention of scam artists. What if I get all rich and currency-laden in the future and start splashing cash on the auctions? It could happen. What’s being done to spot big-money fakes in the marketplace and protect my hypothetical future investments? When I ask around, I’m told that shonky whisky is most often sniffed out by professionals who handle premium product at auction houses, or vigilante booze nerds committed to truth and justice in whisky. These people are so in-the-know that they can apparently tell a knock-off from the real deal just by the colour of a label, the look of a bottle, or the personality of a cork. And apparently that’s exactly how the lid got blown off that caper with the fake Macallan in the Swiss hotel. Well-known whiskyist Serge Valentin, the Poirot of Scotch, and his crew of Malt Maniacs spoke up and blew the whistle. Word has it that they even post pics online of false bottles to help spread the word about how to spot them. Respect. But apparently this isn’t the only way that the whisky world is fighting fakery. When I take my questions to whisky bars and bottle shops, it’s patiently explained to me that the fight against forgery is going hi-tech. Apparently, custom bottles with holograms and other futuristic swag have been around for a little while – who knew, right? I’ve been so busy trying to get my head around the juice that I never realised how much thought goes into the cork and stuff. I’ve even learned that tech-savvy eco-distillery Ardnamurchan’s new releases come with QR codes and sophisticated blockchain technology. Now I might not be the best person to ask exactly who or what that is, but it seems like you can use it to tell where your sauce bottle has been, what its star sign is, and exactly how real its contents are. So there we go. The headlines crying whisky shenanigans have some truth to them: the fashionability of fine whisky and the fat stacks to be made on the secondary market have attracted fakers, but the industry is fighting back and it’s going to be harder to pass off imitations in the future. Seems like I should take exciting whisky headlines with a pinch o’ salt rather than walk into my local booze shop and start questioning the realness of their wares. This problem is serious, but not necessarily everywhere. Dig? Till next time, whisky friends. Stay safe and don’t get hustled. 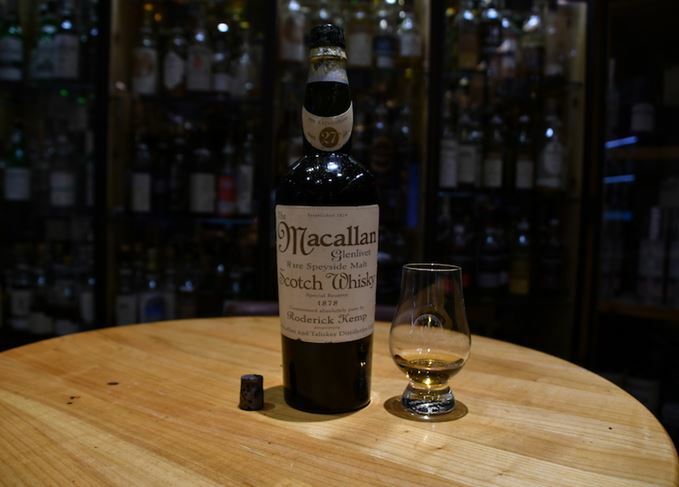 The ‘fake’ 1878 Macallan opened at a Swiss hotel has its roots in a saga from the 1990s. The removal from public display follows a hotel guest paying $10,000 for a ‘fake’ 1878 whisky. Could this little black box end fake whisky? This small black box could be a game-changer in the fight against counterfeit whisky. An investigation has been launched following the purchase at a St Moritz hotel by a Chinese guest. Counterfeit copies of western brands don’t just disappoint consumers – they can kill them.